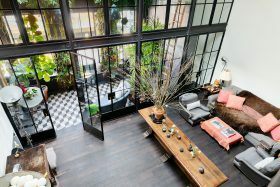 The listing calls this three-floor home atop a classic Soho loft building at 12 Greene Street a “reimagining of urban living” that “defies easy categorization,” and we’d have to agree. 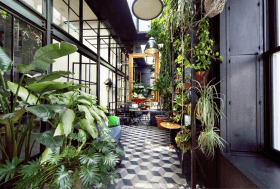 But what’s instantly recognizable is the design knowledge and creative eye that was behind the construction of each room’s eclectic but beautiful balance of form and function, including layers of verdant garden-draped patios, decks and terraces. Records show that the current owner purchased this 4,500 square-foot co-op for $1.7 million in 2005, which in itself sounds like quite a feat; the triplex is now asking a far more 21st century $16 million.